I’m sure you can. 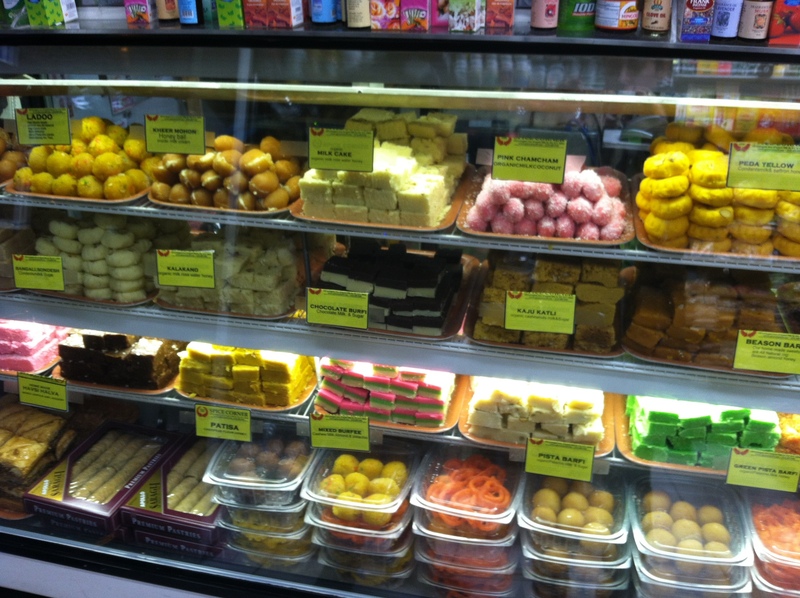 The more difficult question is: When faced with a case of South Asian sweets, what should one order? Depending on the time of day and the occasion, the correct answer is: As many different items as possible. But given that I was coming from a filling curry and dosa dinner, the prospect of ordering pounds of sweets made me a little nauseous. In this instance, I did what any rational, fully-sated person would do. I went for the most outlandish, over-the-top item I saw. 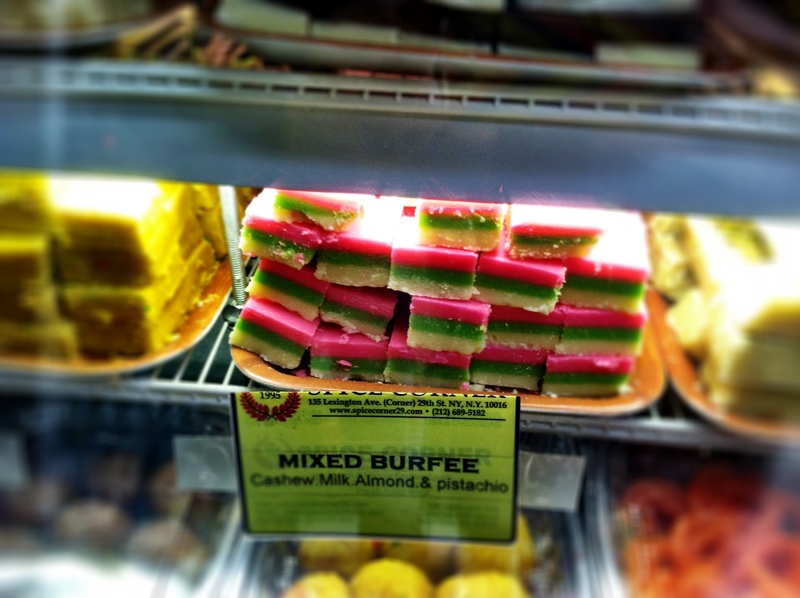 Thus, the mixed burfee. 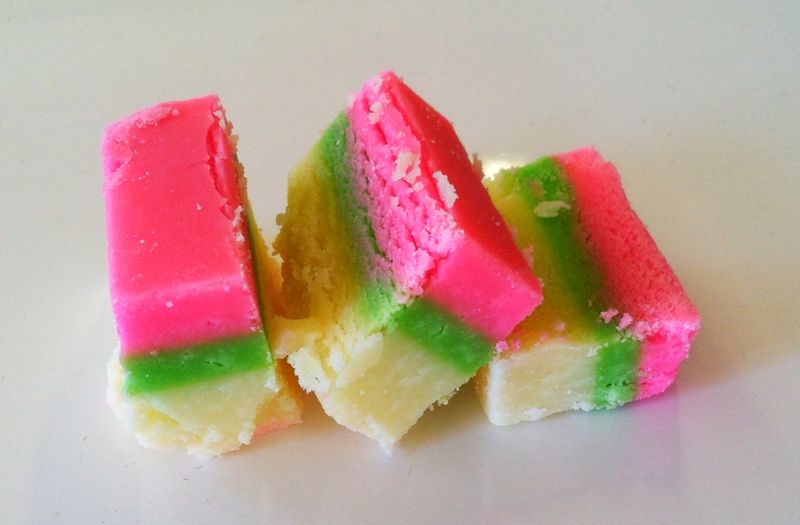 South Indian snack or exotic rainbow cookie? Burfee (and its orthographic cousins “burfi” and “barfi”, among others) is a South Asian dessert usually made with condensed milk and sugar, often filled with nuts and spices, cut into blocks or diamonds, and served at room temperature. For this reason, burfee has been referred to as “Indian fudge”. Spice Corner has over a dozen different types of burfee – chocolate, cashew, almond, carrot, for starters – but I went with the mixed burfee for an unmarked (but assuredly reasonable) price. 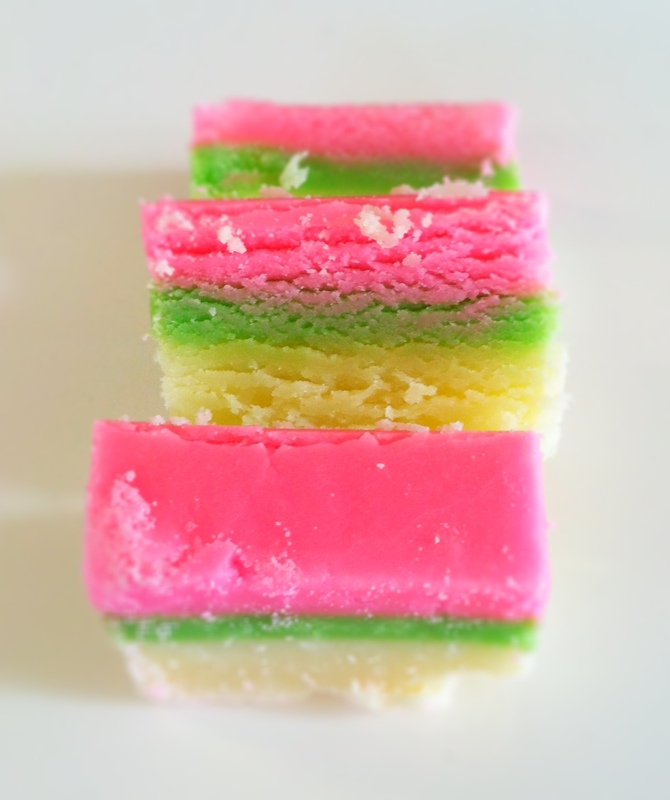 Choosing was a challenge, and it might be a tad dishonest to say that I wasn’t swayed by the pretty colors, or the fact that the tri-color layering brought to mind another favorite treat of mind, the rainbow cookie. Spice Corner’s mixed burfee is supposedly cashew, milk, almond and pistachio, but I would be remiss if I said the block tasted like anything other than pink, green, and white sugar and milk, with a slight nutty flavor. In fact, eating it became a bit of a psychological test. Did the green part really taste like pistachio, or was I imagining pistachio flavor because I know pistachios are green? Was that a hint of cardamon I detected, or was I just hoping for it since I love cardamom in Indian desserts? Priming, indeed. What the burfee really reminded me of was yet another tri-colored treat: candy corn. While slightly grainier than either fudge or candy corn, the pure sugar sweetness of this particular burfee will likely appeal to people who like this Halloween standard. This is to say, if you like toothachingly sugary candy, you will probably adore this. Luckily I do love candy corn. And variety. Stay tuned, because there will likely be more posts where Spice Corner is concerned. You MUST get this with me sometime. That display case is irresistible. For sure! Even I will need help consuming all of this sugar.